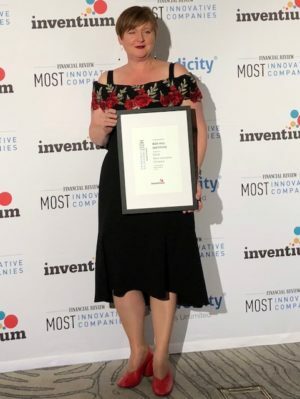 Box Hill Institute was honoured to be recognised as one of Australia and New Zealand’s Most Innovative Companies, one of only thing education organisations to make the list. The prestigious annual list, published by The Australian Financial Review, is based on a rigorous assessment process managed by Australia’s leading innovation consultancy, Inventium, in conjunction with a panel of industry expert judges. The full Top 100 list can be viewed at https://www.afr.com. Box Hill Institute ranked 52 on the overall list from over 1,000 nominated organisations across Australia and New Zealand. The assessment measures a top innovation implemented in the past twelve months. Specifically, the judges look at how valuable the problem is that the innovation is solving, the quality and uniqueness of the solution, and the level of impact that the innovation has had. Inventium assesses internal elements such as innovation culture, strategy, resources and process, which demonstrate a sustainable and repeatable approach to innovation. Inventium CEO, Dr Amantha Imber said, “The field of entrants for the 2018 AFR Most Innovative Companies list is the highest quality we have seen in seven years of judging the list. Box Hill Institute was thrilled to be recognised for its innovative business model. The Box Hill Institute re-opened the Lilydale campus by building in multiple commercial revenue streams and partnerships into the site. The business model was greater than the re-opening of a campus, it is a comprehensive education precinct encompassing lifelong learning facilities with seamless pathways for students to transition from school, into TAFE and onto further education on the one site. The Australian Financial Review Most Innovative Companies list is now in its seventh year. The list ranks the most innovative organisations in Australia and New Zealand, and is the only national, cross-industry list of its kind. The list is judged and compiled by Inventium.